I have read recently about a Chinese version of Christianity brought to China in the 7th century by a Persian priest called Alopen. 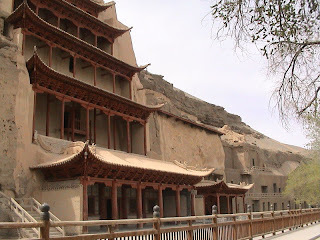 There were some writings composed by this group of Christians unearthed in 1900 in the Mogao Caves near Dunhuang, in Gansu province China that contained what we call the Jesus Sutras. These writings were composed from 625 CE to 1005 CE when they were sealed up in the cave. After being found in 1900 they were stored in a Buddhist temple until they were rediscovered and then translated in 1998. What they reveal is a blend of Christianity, Buddhism, Hinduism, and the Tao. In one section Jesus is portrayed as talking about karma. Thomas Moore asks, "I wonder if the Christian teaching might have a deeper understanding if we did associate it with the idea of karma for a moment." Thomas Moore goes on to say, " A lot of people think of Christianity as a moral religion: what is right and wrong, what not to do, people in authority telling you how to live. The trouble with that is if you follow all these things, you may not really live a moral life. You may be following the rules, but not be deepening your ethical sense as you grow up and live a more complicated life. If you're thinking of karma, you don't have quite that same emphasis on morality. Instead, you realize that everything you do, every minute, has its impact and consequences. That leads to a moral way of living, but with a different quality than the one I described before." When asked to compare Christianity with Buddhism Thomas Moore says, "But I think it goes deeper than that, because I think within Christianity-certainly in the way it's come down historically-people worry about being virtuous: Am I doing the right thing, am I a good person? In Buddhism as I know it, which is much less than I know Christianity, I would say people would be more interested in what sort of wisdom you have. Do you have some degree of enlightenment, are you in tune with the law of nature and of life? That's a different notion from being virtuous." It is an intersting play of words if we state Genesis 1:3 in this way. And the Tao said, "Let there be light," and there was yang. 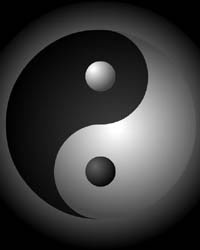 Tao saw that the yang was good, and the Tao was separated, the yang from the yin. Now if the cross is the bridge between light and dark and/or a bridge between good and evil then it could be seen as a rejoining of these opposites and a forming of the Tao. One way to see in this in a Christian context is in two ideas that Jesus emphasized. One was not judging others. Judging is the process of separating good from bad. The other is the concept of forgiveness, which is giving up the need to punish or pass judgment. These could certainly be seen as a path apart from good and evil. Buddha called his teaching the middle way and early Christianity was simply called The Way. In a world that considered an eye for an eye and a tooth for a tooth as the highest form of justice, forgiveness and not passing judgment would seem like radical concepts. These concepts are almost incomprehensible for the Western mind coming from a Roman justice ethic. In many ways these are Eastern understandings of the underpinnings of ethical behavior or of beautiful behavior. Some have said that it is not goodness that defines the highest ethic, but beauty. When we use the word Grace, it encompasses forgiveness, the giving up of judgment, and Grace itself is often seen as one definition of beauty. Truth, Grace, and the American Way?